When it’s time to move, you need a company that you can trust. Let’s Get Moving gives you a free quote, professional service, experienced movers, an, perhaps most importantly, peace of mind. Whether you live in St. Petersburg and are moving north county to Clearwater, or you're getting ready for a cross-country relocation, Let's Get Moving is Tampa Bay's premier choice for residential moving services. From full-service packing and shipping to delivering furniture, storage units, and more, our team of professional movers can accommodate any home, mobile home, townhome, apartment, or condominium. No matter where you're going or what your budget is, Let's Get Moving has an affordable, cost-effective home moving solution for you. Nowhere else in Tampa Bay can you find a residential moving company as reliable, affordable, or as efficient. See the difference with us! Call Let's Get Moving today at (888) 204-9666 or in St. Petersburg 727-LGM-MOVE (727-546-6683) to request a free quote! 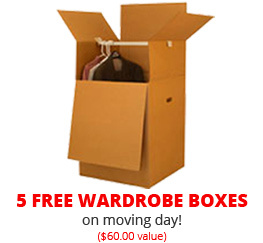 Be sure to ask us about our wardrobe box usage, FREE on the day of your move (valued at $60). We also provide full placement of furniture and boxes. Everything we disassemble we will reassemble at your new location.